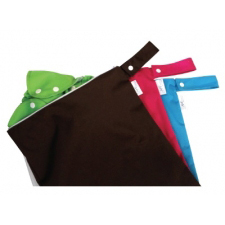 These charming simple bags are the perfect way to store soiled diapers when out and about. There is always a grocery bag laying around, but who wants to use a garbage bag to store their beautiful diapers in? Our wet bags have an easy to use zippered opening and enough room for a days worth of diapers, plus they can be used over and over and still look new! Available in many great colors, so they can co-ordinate with the diaper bag. Using cloth should be fun and fashionable! Great for daycare use and storing wet bathing suits too!